Two or more years of hard work, sleepless nights, and a lot of sacrifices in terms of hobbies, spare time and family life – this is the price our students have to pay for succeeding with their Master studies. Studying part-time is tough since it is very challenging to combine your studies, job and family life over a long period of time. However, as we can see every year, our students are able to manage it. Their studies at the WIT always culminate in a joyful graduation ceremony followed by a graduation party. Therefore, end-November is an exciting time of the year for everybody at the institute. More than thirty WIT students have successfully completed their studies in 2018. Twenty of them have attended the graduation ceremony. Never before has the WIT honoured as many graduates as this year. Our students represented our Aviation Management and Master of Business Administration study programmes as well as the Renewable Energies Master programme that we have offered in the past. Moreover, for the first time, we have been issuing certificates to the graduates of our youngest study programme – Library Computer Science. This study programme has been offered since 2015 and has become an essential part of our portfolio, so we are more than proud to see the students of the first run of the programme graduating. Prof. Dr. Thomas Biermann, Executive Board Chairman at the WIT, has started off the ceremony. He introduced Volker Thum, Managing Director of the German Aerospace Industries Association, who held a keynote speech and emphasized the importance of cutting-edge education for managing future challenges. In particular, he mentioned that the Aviation Management programme is providing the necessary expertise for mastering two core transition paths – digitalization and decarbonisation. After Mr. Thum’s the inspiring and motivating speech, the protagonists of the evening took the centre stage. Yulia Tkachuk, Aviation Management graduate, especially mentioned the practical relevance of her studies. She pointed out that although the in-house weeks were very intense, she and her classmates were always looking forward to the lectures, even if they were scheduled at 8 o’clock in the morning. Tracy Hoffmann, one of our first Library Computer Science graduates, was speaking on behalf of the pioneer run of the programme. Indeed, the ‚beta-test‘ was not perfect but proved to be very enlightening, since the studies were rich in substance and the quality evolved in the course of the programme. In sum, Ms. Hoffmann pointed out that due to the study programme, she was able to significantly improve her ability to tackle information challenges in the age of digitalization. After all the speeches were held, it was time for the most important and moving part of the evening. 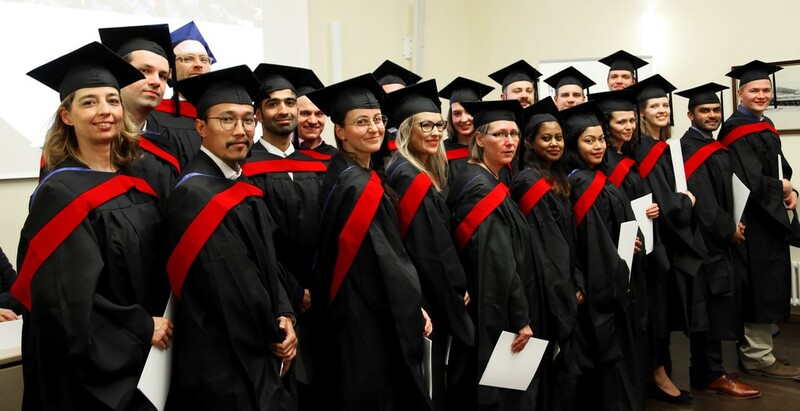 Professor Ulrike Tippe, President of the Technical University Wildau and former Board Member at the WIT, awarded the certificates to the students and wished the fresh graduates much success. The joyful time after the certificates were handed out continued during the graduation party. Our graduates received their presents – a symbolic picture from the kick-off, the first day at the WIT, and small presents officially certifying that the student has completed his or her studies at the WIT. At the end of the evening, the WIT team was delighted about the fact that 80 guests have attended the graduation ceremony, among them our students, alumni, lecturers, and family members. But most importantly, twenty graduates from nine countries have completed their studies. Our students often find the time of their studies quite stressful and challenging. However, they value the academic and professional development they take away after the studies. Also, studying a Master programme while staying on the job and having a family is something like an ultimate challenge in managing life in general. Our graduates have mastered their studies with grace. This makes us confident that no future challenge will be too great for them. We wish our graduates all the best for the future and are looking forward to seeing them again.